President Rodrigo Duterte invited Saudi entrepreneurs to invest in the Philippines, seven business deals worth $470 million were signed between the Philippines and local businessmen. 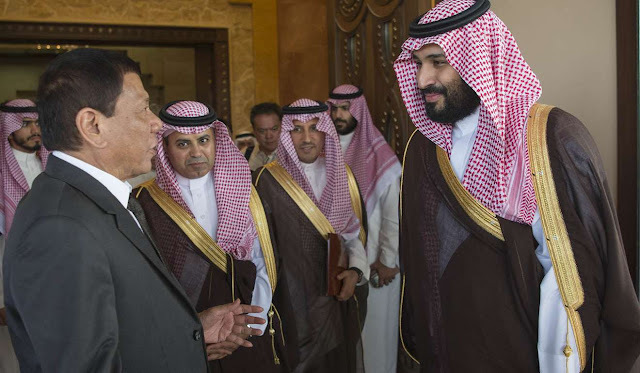 President Duterte witnessed the signing of the agreements during a business forum attended by top business leaders of Saudi Arabia and the Philippines. “The estimated amount of investment is about $470 million. That will create 16,000 new jobs in the country,” Trade secretary Ramon Lopez said in a press conference here. "We look forward to a much stronger relationship with Saudi Arabia. They’re doing a lot for our citizens here and we see bright prospects,” he added. Lopez declined to name the companies who will sign the agreements but revealed that they are into halal production, tourism, hotels, pharmacy, manufacturing, agriculture, engineering, tourism and logistics. “It was good that the president himself is our trade and investment ambassador. Every time he talks with his counterpart, he pushes for trade and asks them to buy more of our exports and invite investors to the Philippines and to take advantage of the current economic boom we are experiencing,” Lopez said. Lopez said he was optimistic regarding the outcome of the presidential delegations visit as well as in the bilateral trade volume between the two countries.